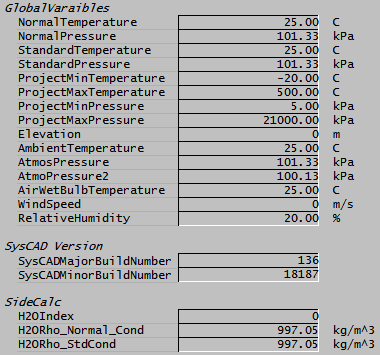 This class only exists in SysCAD 9.3 Build 136 and later. The Plant Model Class, provides a member function to retrieve global values defined in the Plant Model. Values that can be retrieved with the Plant Model Class include the Environmental Global values as well as the User Defined Global Values (PUV). The Plant Model Class can be used in PGM or Model Procedures files. Functions to return Plant Model | Environment Tab . Version(Index) Retrieves the SysCAD version or build number. This page was last edited on 18 October 2017, at 03:27.